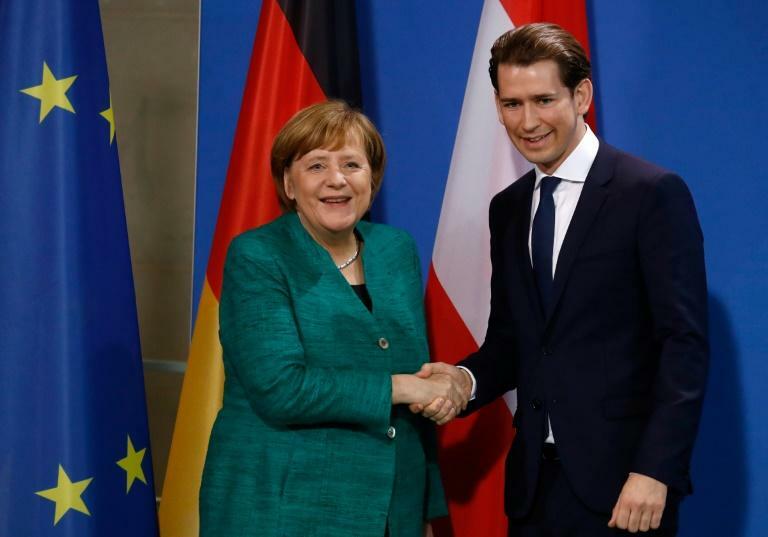 Angela Merkel and her Austrian counterpart Sebastian Kurz clashed over immigration in their first meeting Wednesday, with the seasoned German chancellor saying Vienna's resistance to sharing out refugees across the bloc was "wrong". Kurz, at 31 the world's youngest leader after forming a government with the far right last month, said following talks with Merkel that the debate about mandatory migrant quotas "took up too much space". "I'm convinced that the solution to the migrant problem lies with decent border protection and stronger help in countries of origin," Kurz told reporters after he was received in Berlin with military honours. While Merkel echoed those priorities, she also chided the member states that have refused to take in their share of migrants and refugees under the European Union's quota system. When external border protection fails, "it cannot be, in my view, that there are some countries that say 'we don't want to participate in European solidarity'," she said. Austria has sided with countries such as Hungary, Poland and the Czech Republic that reject the scheme, agreed by a majority of EU leaders in 2015, to share 160,000 migrants around the bloc to help frontline states like Greece and Italy. Just some 32,000 were relocated by the end of 2017. Kurz, who was foreign minister at the height of Europe's migrant crisis, was one of the fiercest critics of Merkel's contentious decision in 2015 to open Germany's borders to those fleeing conflict. The move prompted an influx of nearly 900,000 asylum seekers to Germany that year alone, although arrivals have slowed significantly since then. Kurz came to power after taking over the conservative People's Party (OeVP) last year and yanking it to the right, with a hardline stance on immigration. His government is the only one in Western Europe to feature the far right after he struck an alliance with the controversial Freedom Party (FPOe). Merkel stressed the "close cooperation" between Germany and Austria and their shared positions on many issues. She said she would judge the new government in Vienna "by its actions", but added that she would be watching closely. "We will keep an eye on everything else -- perhaps I will a bit more than I would have otherwise done. But what matters are actions," she said.